This powerful Class B/SO* AIS transceiver will make your boat "visible" to other vessels with AIS over long disances and in challenging conditions with its 5-watt transmission power. 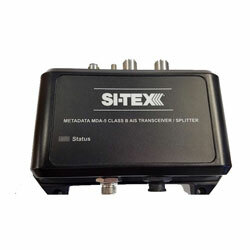 The SI-TEX Metadata MDA-5 module transmits at more than twice the power of traditional Class B AIS transceivers to put you on more screens for increased safety. *SOTDMA stands for Self-Organized Time-Division Multiple Access and means as AIS info comes into the receiver, it organizes the data into time slots that are time-shared with a TDMA receiver. It transmits at 5W at high power, twice the power of traditional Class B AIS Transceivers — so your boat can be "seen" over long distances and in the most challenging conditions.